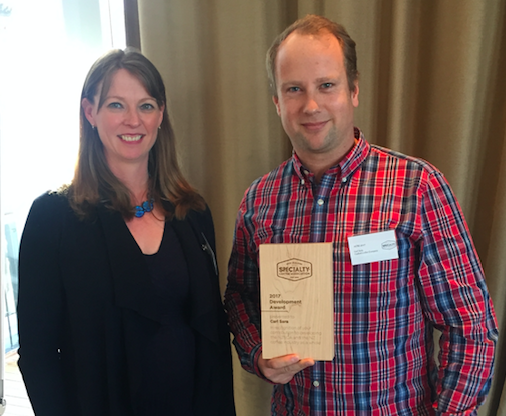 Two outstanding members of the New Zealand coffee industry were recognised at an awards ceremony at the Association AGM on Thursday 18 May. Former Association President Karla Gichard presented Emma Markland Webster and Carl Sara with Recognition Awards. 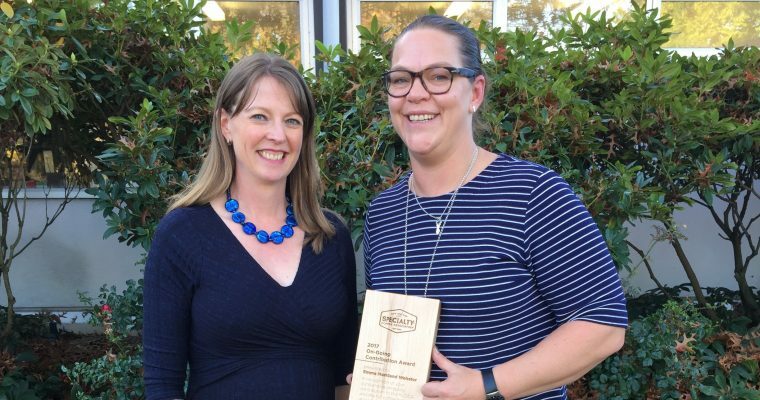 Emma’s ongoing support, contribution and dedication to the New Zealand specialty coffee industry as a whole is clear to everyone that has met her. She has been a mainstay in the New Zealand competitions and was the country’s first representative on the world stage, as well as being one of the contributing members in the formation of the NZSCA which back then was the New Zealand Coffee Roasters Association. Emma now splits her time between her own consulting, business Monster Truck Coffee, AMC Roastery Supply and is also the event manager for the NZSCA. Her pursuit and drive to make New Zealand specialty coffee the best it can be, made Emma a stand out nominee for this category. She is a fountain of knowledge and is always happy to share. Working closely with World Coffee Events and development of the world competitions is an experience that Emma brings back and shares with the New Zealand coffee industry and is instrumental in ensuring the New Zealand competitions are up to the world standards. Carl’s input in developing New Zealand coffee has been obvious over the years. He has an extensive background in coffee, having competed four times in the New Zealand Barista Championship and represented New Zealand on the world stage. He now owns Crafted Coffee in Christchurch where he roasts and imports his own coffee. Carl works closely with World Coffee Events and World Barista Championship to develop the competitions. With his input at this level, he effectively represented the New Zealand industry by proxy and has been an excellent ambassador for the New Zealand coffee industry globally. Beyond this, he has been a driving force behind the Association’s constitutional changes, a contributor and a brilliant ambassador for our industry with an impressive number of years on the board.